Welcome to our Burial products section. Here you will find a listing of all of the products that we currently have available for selection. 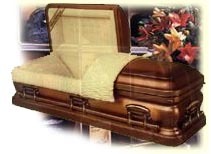 Families choosing a mausoleum crypt as a means of disposition will also find the selection of caskets for there use. You will also find Burial vault selections. These are often selected by families as a means of protecting the casket from the earth elements. Our counsellors will be able to assist you in finding a casket to meet your need or if you are looking for a specific model. Our counsellors can be reached at 416-251-7531.